To compare the sealability of femtosecond laser–constructed and manual clear corneal incisions (CCIs) in patients undergoing cataract surgery. This prospective, randomized study included 62 eyes of 62 patients with cataract grade 1 to 2 (LOCS scale). The patients were randomly assigned (1:1) for creation of either manual CCI (with a 2.4-mm keratome) or femtosecond laser–assisted CCI (LENSAR, Inc., Orlando, FL) (31 eyes in each group) before undergoing femtosecond laser–assisted cataract surgery. Wound sealability was assessed as grade 1, 2, or 3 (1: need to reform anterior chamber and hydrate wound at end of surgery; 2: need to reform anterior chamber only; 3: formed anterior chamber, no hydration or anterior chamber reformation necessary). The nuclear sclerosis grade, cumulative dissipated energy and phacoemulsification time were comparable between the two groups. No complications were experienced in any of the patients. The mean wound sealability for the femtosecond laser group (2.35 ± 0.84) was statistically significantly better in comparison to the manual group (1.32 ± 0.65) (P < .001). At the end of the surgery, 22.6% (n = 7) of eyes in the femtosecond laser group needed reformation of the anterior chamber and hydration of the wound compared to 77.4% (n = 24) of eyes in the manual group. 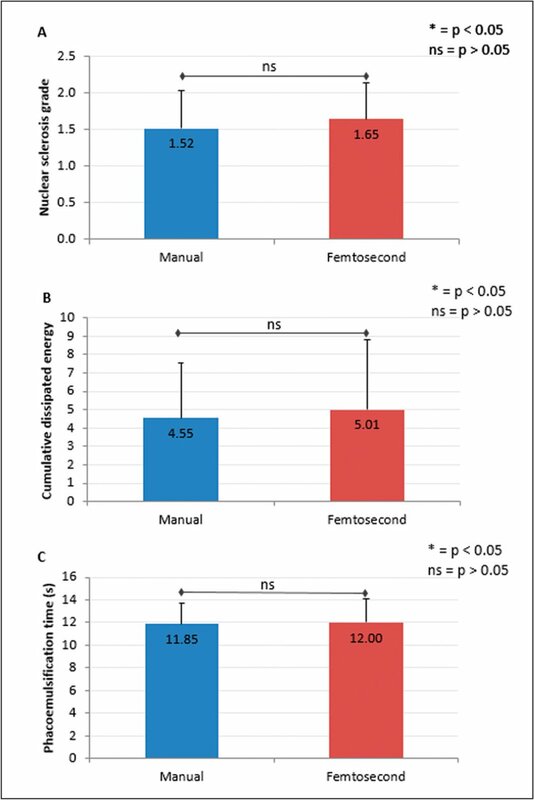 Conversely, 58.1% (n = 18) of eyes in the femtosecond laser group compared to 9.7% (n = 3) of eyes in the manual group were observed to have a formed anterior chamber. Femtosecond laser–created CCIs had significantly better wound sealability compared to those created with a metal keratome. Computer-guided construction of CCIs by femtosecond laser has recently been introduced to achieve better wound architecture.6,7,10 Several anterior segment optical coherence tomography (AS-OCT) studies of incision geometry have indicated that incisions constructed by femtosecond laser are more square, multiplanar, consistent, and reproducible. This is likely to be because the femtosecond laser provides precise construction of the length, angle, plane, and shape of the CCIs,3,7,9,11,12 which may contribute to better sealability.7,9,11 Therefore, the current pilot study intended to compare the sealability of femtosecond laser–constructed CCIs and manual CCIs in patients undergoing cataract surgery. This prospective, randomized pilot study was performed at the Peregrine Eye and Laser Institute, Philippines. The study adhered to the tenets of the Declaration of Helsinki and was approved by the Peregrine Eye and Laser Institute's institutional review board. Sixty-two eyes of 62 adult patients (39 females and 23 males) with nuclear cataract of grade 1 to 2 (on the Lens Opacities Classification System III [LOCS III] grading scale),13 who were candidates for phacoemulsification and intraocular lens (IOL) implantation, were enrolled after obtaining informed consent. Patients with pathological alterations of the anterior segment (eg, corneal opacities, keratoconus, chronic uveitis, zonular dialysis, pseudoexfoliation syndrome, and Fuchs endothelial dystrophy), and previous anterior or posterior segment surgery were excluded. All surgeries in both the manual and femtosecond laser groups were performed by a single surgeon (HSU). In the manual procedure, a temporal triplanar corneal incision was attempted with a disposable 2.4-mm keratome knife. In the femtosecond laser group, CCIs were constructed using the LENSAR Laser System (LENSAR, Inc., Orlando, FL). The procedure was performed using a non-applanating, single-use patient interface with a water bath to avoid corneal distortion. The laser energy used was 4 microjoules with a spot size of 6 μm and shot spacing of 8 μm. A triplanar, rectangular (Figure A, available in the online version of this article) wound was created with an incision width of 2.4 mm, and the entrance and exit angles of 0° (with respect to the normal to the ground) and 40° (with respect to the normal to the posterior corneal surface at incision exit site), respectively. Triplanar incisions with automated targeting of mid-tunnel depth at 50% of the corneal thickness were created. The tunnel length was 0.9 mm. In an effort to improve the success rate of the wound opening, the following maneuvers were performed: (1) temporal approach for all eyes, (2) entrance wound placement 1.5 mm from the surgical limbus to mitigate the interfering effect of arcus senilis on laser cutting, and (3) use of two laser passes in the entrance wound creation to lessen the incidence of uncut tissue bridges. (A) Cross-sectional diagram demonstrating triplanar wound architecture (yellow line) with 0.9 mm main tunnel placed at 50% corneal thickness. (B) Down the pipe view of temporal, rectangular 2.4 mm wide × 0.9 mm long clear corneal incision (inferior white area). Procedures involving capsulotomy and lens fragmentation were similarly performed for both groups with the LENSAR femtosecond laser. A stab side-port incision was similarly performed in both groups using a 1.2-mm keratome. The phacoemulsification technique (using the Centurion system; Alcon Laboratories, Inc., Fort Worth, TX) was the same for the two groups, followed by the implantation of an AcrySof IQ IOL (Alcon Laboratories, Inc.) in the capsular bag using the Monarch III injector and Monarch D Cartridge. The wound was not extended for either of the types of corneal incisions for implantation of the IOL. After removal of the irrigation and aspiration probe, 0.05 mL of intracameral moxifloxacin was injected through the side port. The surgeon then determined whether the anterior chamber was formed or flat via direct visualization through the surgical microscope. If the anterior chamber was formed, this was graded as a wound sealability score of “3.” If the anterior chamber was flat even after intracameral medication, the surgeon then hydrated the side port and reformed the anterior chamber using balanced salt solution (BSS) injected through the side port and observed for approximately 10 seconds; if the anterior chamber remained formed, this was graded as a wound sealability score of “2.” Should the CCI leak again, causing flattening of the anterior chamber, then the sides of the CCI were hydrated and the anterior chamber reformed through injection of BSS via the side port. CCI wounds that needed hydration were graded as a wound sealability score of “1.” Wound sealability was confirmed in all eyes using the Seidel test by placing a sterile fluorescein strip at the CCI wound edge. A cellulose sponge (Weck-Cel; Beaver Visitec, Waltham, MA) was used to apply pressure immediately posterior to the wound lip. The wound was then observed for wound leak (Seidel positive). If the wound was Seidel positive, repeat CCI hydration and reformation using BSS injection through the side port was performed until the anterior chamber was formed and the CCI was Seidel negative. Postoperative therapy consisted of ofloxacin 0.3% and prednisolone acetate 1% (Exopred; Allergan Philippines, Pasig City, Philippines) eye drops four times daily for 3 weeks for both groups. Statistical analysis was performed using SPSS software (version 17.0; IBM Corporation, Armonk, NY). Study variables with normally distributed scale data (cumulative dissipated energy, phacoemulsification time) were compared between the two groups using the independent t test and those with ordinal data (wound sealability and nuclear sclerosis) were compared using a Mann–Whitney U test. A statistically significant difference was based on the maximum possible probability of a type I error, α = 0.05. Patient demographics and baseline characteristics including age and cataract grade were similar between the two groups. The mean ages of the patients in the femtosecond laser and manual groups were 67.4 ± 10.7 and 64.4 ± 10.7 years, respectively (P = .274). The mean nuclear sclerosis grade was 1.65 ± 0.49 in the femtosecond laser group and 1.52 ± 0.51 in the manual group; there was no statistically significant difference between the two (P = .31) (Figure BA, available in the online version of this article). Similarly, the mean cumulative dissipated energy (5.01 ± 3.78 in femtosecond laser group and 4.55 ± 2.99 in manual group, P = .60) (Figure BB) and phacoemulsification time (12.00 ± 2.07 in femtosecond laser group and 11.85 ± 1.83 seconds in manual group, P = .77) (Figure BC) were comparable between the two groups. No intraoperative or postoperative complications were experienced in any of the patients. (A) Comparison of mean nuclear sclerosis grade between manual and femtosecond laser clear corneal incision (CCI) groups. (B) Comparison of mean cumulative dissipated energy between the manual and femtosecond laser CCI groups. (C) Comparison of mean phacoemulsification time between the manual and femtosecond laser CCI groups. The mean wound sealability score was found to be statistically significantly better (P < .001) for the femtosecond laser group (2.35 ± 0.84) compared to the manual group (1.32 ± 0.65) (Figure 1A). At the end of the surgery, 24 of 31 (77.4%) eyes in the manual group and 7 of 31 (22.6%) eyes in the femtosecond laser group required reformation of the anterior chamber and hydration of the wound (Figure 1B). In addition, 18 of 31 (58.1%) eyes in the femtosecond laser group and only 3 of 31 (9.7%) eyes in the manual group were observed to have a formed anterior chamber and not require anterior chamber reformation. (A) Comparison of mean wound leakage scores for manual and femtosecond laser clear corneal incisions (CCIs). (B) Percentage of eyes exhibiting wound sealability of grade 1 (need to reform anterior chamber and hydrate the wound), grade 2 (need to reform anterior chamber only), and grade 3 (formed anterior chamber, no hydration or anterior chamber reformation done) in the femtosecond laser versus manual CCI groups. Sutureless, self-sealing CCIs are currently the most popular method for construction of cataract surgery incisions because they provide a bloodless operative field and cause the least collateral damage.3,5,14,15 However, there may be an increased risk of postoperative complications with CCIs due to wound leakage during the early postoperative period.5,15–18 Intraocular pressure fluctuations during the early postoperative period may range from as low as 5 mm Hg at 30 minutes after phacoemulsification to as high as 80 mm Hg due to the variation in the extent of fluid reformation in the eye after the procedure and squeezing or rubbing of the eye by patients, which may disturb the wound integrity.15,19 If the CCI is not well sealed, such extreme intraocular pressure conditions may lead to inflow or outflow of fluid, substantially increasing the risk of sight-threatening infections such as endophthalmitis.15,17 Thus, a well-formed CCI is essential to resist wound leakage and hence associated complications. To determine the true clinical effect of wound architecture of the blade versus femtosecond laser–assisted CCIs without the influence of any intraoperative mechanical or thermal injury confounding study outcomes, this study was designed to involve minimal wound manipulation and use of phacoemulsification power during subsequent steps of the surgery. This was achieved by limiting the nuclear sclerosis inclusion criteria to grades 1 and 2. Further, because the differential use of femtosecond laser–assisted and standard phacoemulsification can potentially induce different levels of mechanical injury related to wound stretching and thermal injury related to phacoemulsification,21 the study was designed so that capsulorhexis and the nuclear fragmentation technique were identical in both groups. Phacoemulsification time and cumulative dissipated energy were measured, compared statistically, and found to be comparable (Figures BB–BC). In the current study, Seidel testing was used to help assess wound sealability, which is a common method to test wound leakage. The test involves the application of pressure to the edge of the wound, causing some wound deformation.27 The test would be positive in the presence of wound gaping. A major drawback associated with the use of this test is that there is a lack of standardization of the amount of force applied to determine the presence of a leak.28 Recently, an ocular force gauge has been developed to regulate the amount of force application to the wound, allowing standardization of the Seidel test.29 Future clinical studies using such standardized Seidel testing may verify the results of this pilot study. However, because this study was performed by a single surgeon, variability was likely small. Under these settings, the current prospective study found significantly better sealability outcomes in the femtosecond laser group, with only 22.6% eyes requiring anterior chamber reformation and wound hydration (grade 1) compared to 77.4% of such eyes in the manual group (Figure AB). These results are supported by the outcomes of imaging studies reporting comparatively less endothelial and epithelial gaping, Descemet's membrane detachment, endothelial misalignment, and better wound coaptation during the early postoperative period in femtosecond laser–constructed CCIs compared to manually created CCIs.7,9,11 An ex vivo study on cadaver eyes comparing wound sealability in the femtosecond laser and manual groups reported better sealability (although not statistically significantly better) and more consistent wound geometry in the femtosecond laser group.12 However, in that study, phacoemulsification was simulated; crystalline lenses were not actually removed and there was no insertion of an IOL. The current study compared the wound sealability of manual versus femtosecond laser–assisted CCI in a clinical setting of femtosecond laser–assisted cataract surgery and found statistically significantly better sealability outcomes in the femtosecond laser group. One of the limitations of the current study is that the wound morphologies achieved after CCI creation were not studied. Hence, an association between wound geometry and sealability cannot be evaluated. Wound leakage from single-plane side-port incisions may affect chamber instability; therefore, side-port incisions were examined for wound leakage and, if needed, hydrated to ensure complete apposition prior to evaluating the main CCIs. Further, patients with nuclear sclerosis of grade 3 or higher were purposefully not included in the current study so as to exclude the effect of higher wound manipulation on the wound geometry. Nonetheless, the outcomes in patients with higher nuclear sclerosis grades are expected to correspond to the current study findings. In our investigation of eyes with grade 1 to 2 cataracts, we found that femtosecond laser–created CCI had significantly better wound sealability compared to CCI created with a metal keratome. Buratto L. Phacoemulsification: Principles and Techniques. Thorofare, NJ: SLACK Incorporated; 2003. Jiang Y, Le Q, Yang J, Lu Y. Changes in corneal astigmatism and high order aberrations after clear corneal tunnel phacoemulsification guided by corneal topography. J Refract Surg. 2006;22:S1083–S1088. Matossian C, Makari S, Potvin R. Cataract surgery and methods of wound closure: a review. Clin Ophthalmol. 2015;9:921–928. From the Peregrine Eye and Laser Institute, Makati City, Philippines (HSU); University of the Philippines, Manila, Philippines (HSU); Midland Eye, Lode Lane, Solihull, United Kingdom (SS); and Mark Packer MD Consulting, Inc., Boulder, Colorado (MP). Dr. Uy has received research funding from LENSAR, Inc. and Novartis AG. Dr. Shah is a consultant to Lenstec, Inc. and Oculentis GmBH and has received speaker fees and research funding from LENSAR, Inc. Dr. Packer is a consultant to Alcon (Novartis AG), Bausch & Lomb (Valeant Pharmaceuticals International, Inc.), Keranova, and LENSAR, Inc.